Vivex offers a product range from stand-alone systems to complete turn-key process fluid management systems. 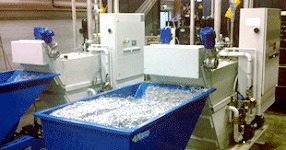 We have delivered over 300 central systems for metal processing fluids world wide. Special requests ? We will customise your solution! Since 1982, Vivex has development, designing manufacturing, marketing, and maintenance of equipment for purification and recycling of process fluids within the metal working industry. 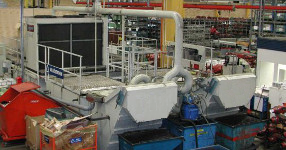 We offer metal working industries unique patented systems for environmentally friendly and effective purification and management of process fluids and waste products, which gives a better working environment, cost savings and increased productivity. Our products work by the principles of gravity separation and self cleaning permanent filters based on our own design. 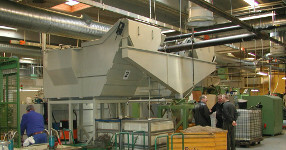 The machines contain limited numbers of moving parts, require a minimum of maintenance and energy consumption, and work completely without consumables such as paper filters or cartridge filter rods. Our products are characterized as: "Lean Maintenance and No Consumables." We handle most types of process fluids in the metal working industry; complete fluid systems, water based cutting, grinding, and washing fluids, neat oil for steel and hard metal grinding and quenching oils. Our systems range from small mobile process fluid purifiers or stand-alone filtration systems for simple applications with a flow rate of 6 lit/min to large central systems with a throughput capacity of 8.000 lit/min that can supply clean fluid for entire production workshops.